I won’t spend too much time on this – it’s not worthy of attention except from the Courts. 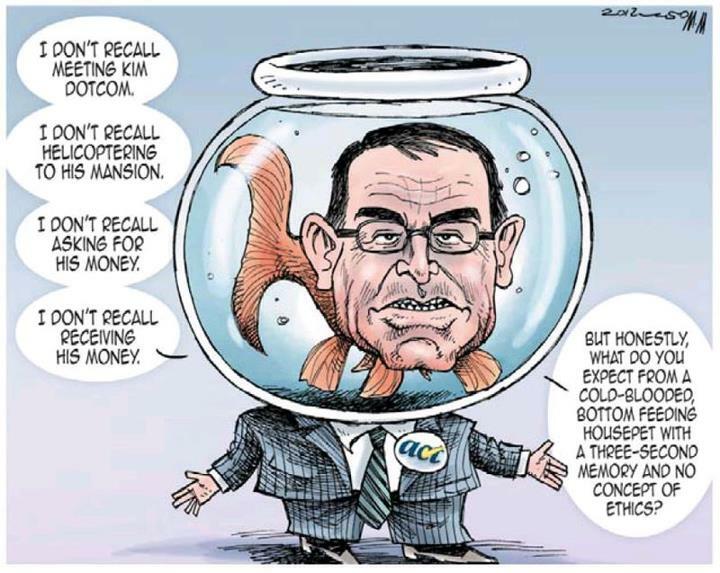 I’ll state the obvious that I am no fan of right wing politics; neo-liberalism; the ACT Party, or John Banks’ beliefs. We are diametrically opposed in our world-view. I will say, though, that throwing a bucket of manure at another person is not a political statement. It is a lazy, inane, brainless way to make a point. Any buffoon with barely two inter-connecting neurons can do it. 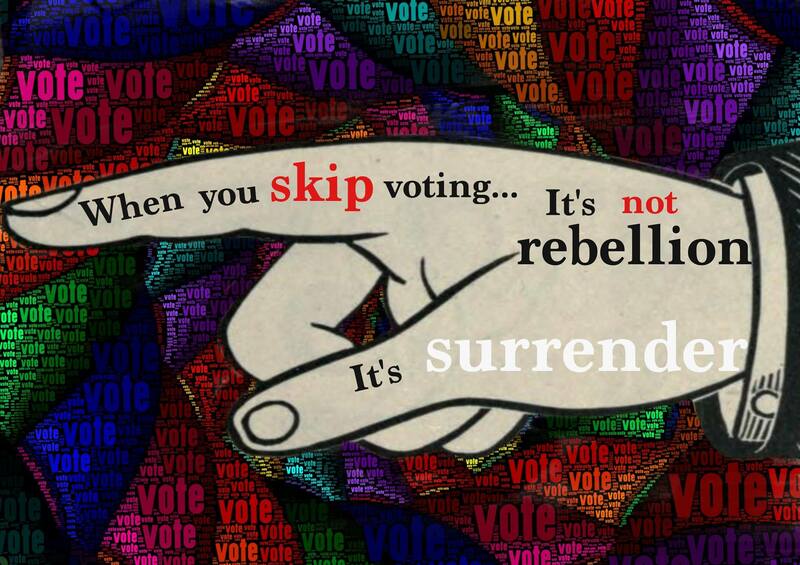 A real, effective, political statement may be more time-consuming but is one that ultimately gets people thinking. The only thought that crossed my mind about Sam Bracanov’s behaviour is “silly old bugger”. – is a limp joke. 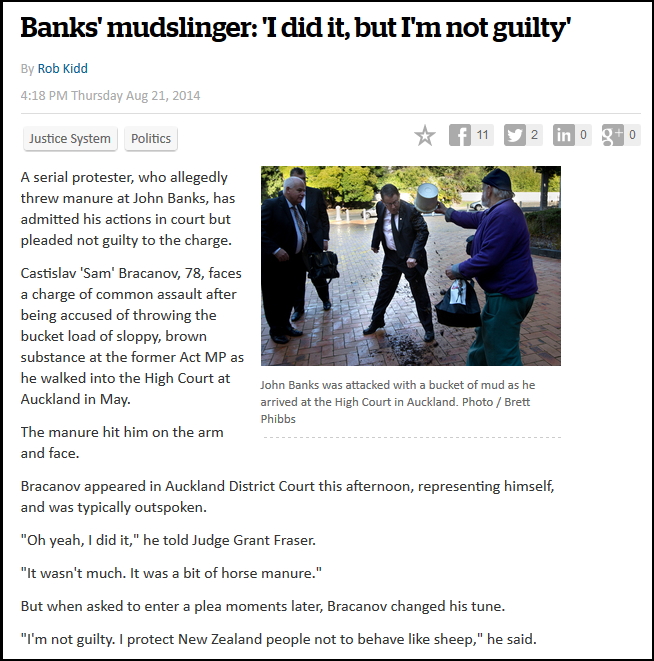 All that Sam Bracanov has achieved is garner sympathy for John Banks and make left-wing activists look like nutters. That is not how New Zealanders – Left or Right or Up or Down – should be doing politics. 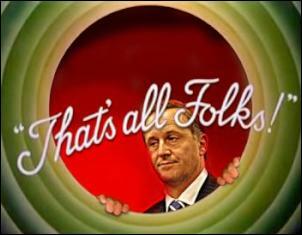 As at 5pm on Friday, 13 June, John Banks resigned from Parliament. In retrospect… As per usual, those on the Right appear unable to accept that they too must uphold the laws of the land. The verdict in the John Banks trial will send a “chill up the spine” of every political candidate, says former National Party president Michelle Boag. 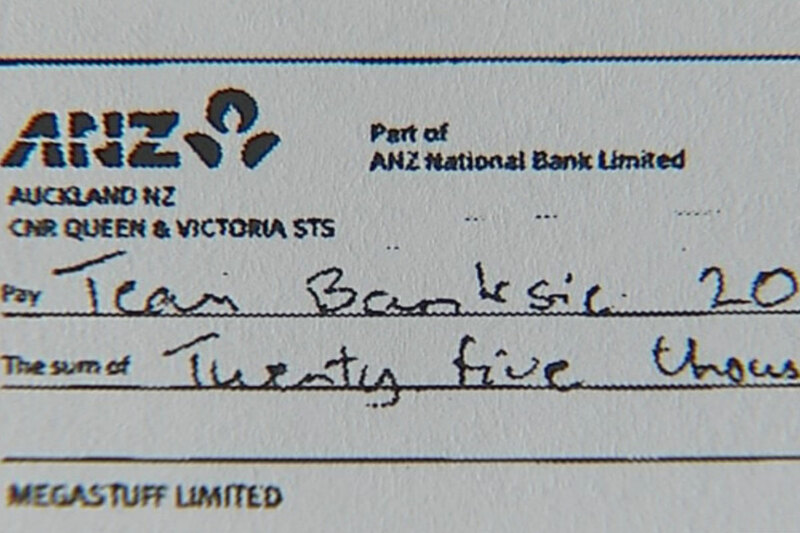 Boag, who was an adviser to Banks during the failed 2010 Auckland mayoral campaign, said although Banks had been found guilty, he had done just the same as “every political candidate who has put in a donation form”. “So the court has found John Banks guilty. Three observations. First, I have known John Banks for 30 years and have not found him to be anything other than an honest man. Second, it is a huge tragedy for a man who has overcome great personal difficulties; served with distinction as a Member of Parliament, as a Minister, and as the mayor of Auckland; and helped to raise three Russian orphans. But third, when I contrast what John Banks was found by the court to have done with what Helen Clark’s Labour Party did in 2005 – without the slightest attempt by the Police to call her to account – the offence of which he has been found guilty is utterly trivial. In 2005, the Labour Party spent Parliamentary funding to the extent of more than three-quarters of a million dollars on explicit electioneering, despite having been warned against doing so by both the Auditor General and the Chief Electoral Officer just weeks before the election. Yes, they eventually repaid that money, but only under strong protest. And of course by that the time the election was won. And what they could not undo, and were never held to account for, was grossly overspending the legal limit on spending in that election. The Police, in a disgracefully biased decision, decided not to prosecute, despite the Labour Party’s own auditors finding that the Party had unambiguously breached the legal spending limit if spending on their infamous “pledge card” was election spending. And did anybody who saw that “pledge card” think it was NOT part of Labour’s election campaign? Found guilty – but “not convicted”. Ethics 101, according to Gerry Brownlee. Ironically, Kim Dotcom has not been found guilty of any crime in New Zealand and yet the Nats wants him extradited to the United States. As in, potentially goneburger to a US jail. Based on Farrar’s bizarro-world “logic”, burglars should not be prosecuted because home invasion robberies “were much more significant and did have an impact” on home-owners?! So honest that he (a) was tried in a Court of law, (b) was found guilty, and (c) has resigned. Asked about Cunliffe’s claims that the Government was being propped up by a “corrupt” politician, Key said Cunliffe should rule out working with the Internet Party. Point of interest; John Key appears to be out-of-the-loop and several months behind-the times. John Banks was not the “leader of another political party“. 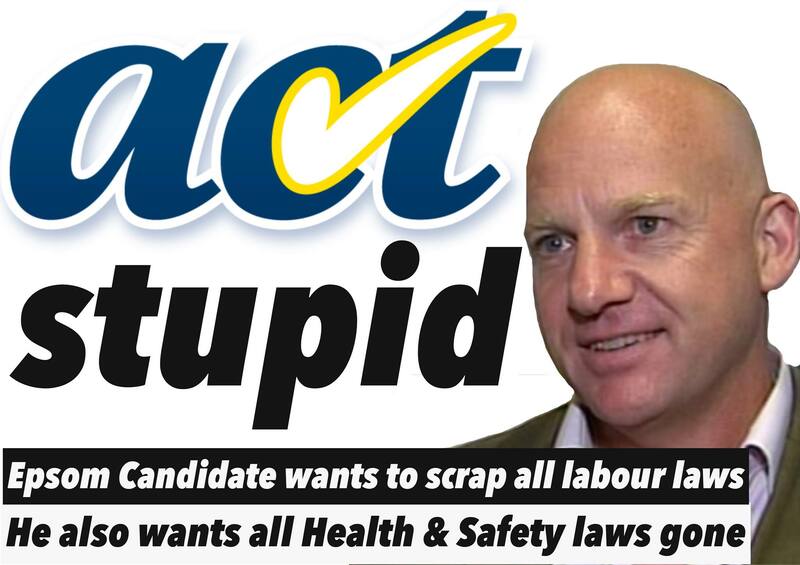 The current leader of ACT is Jamie Whyte. “…Graham McCready, the convicted tax fraudster and the man who brought the private prosecution against Banks after the police declined to lay charges, is an odd creature. Act Party campaign director Richard Prebble, said the verdict was in conflict with the attitude towards campaign donations that he’d encountered during his years in parliament. Prebble said the loose approach to the rules revealed “the nonsense of the thing”. He said when he started his career in local body politics, he wasn’t required to fill in electoral donation forms, “and I’m not sure why you have to now. Prebble said while the nominal reason for requiring electoral donation returns might be to prevent the impression of undue influence by political funders, “the real reason is to intimidate people to stop them giving money to your political opponents. 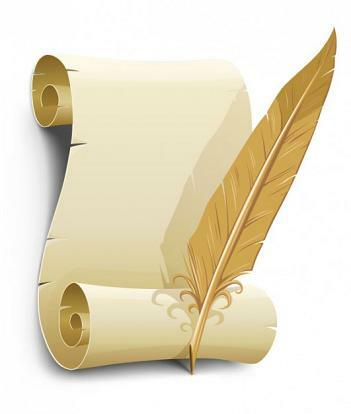 So Prebble has “seen declarations that are total fictions” – but done nothing about them?! Is this how a former ACT Leader and MP upholds the law? By turning a blind eye to it being broken? Very civic minded, I don’t think. As for the electoral law on donation returns being “ just part of the political correctness of New Zealand, and all we do is catch people out with paperwork” – so some laws exist merely to inconvenience us? Perhaps quite a few others who are currently “guests of Her Majesty” thought along the same lines. However, let’s work with what we’ve got, eh, John? Those on the Right of the political spectrum probably believe that Banks’ actions were minor. They point the finger at alleged wrongdoing by Labour or other parties on the Left. They may even believe that the trial and guilty verdict was unnecessary. Meanwhile, on the Left, the belief (unsurprisingly) is diametrically opposite; the crime of electoral fraud is not minor; pointing to alleged wrongdoing by Left-wing parties is a vain attempt at deflection to distract public attention; and the guilty verdict was necessary. Either the law on Electoral Returns is a law to be enforced, or it should be repealed and left up to individual parties and candidates to make voluntary disclosures. But it cannot be left to stand and be observed in a half-hearted, cavalier fashion. Otherwise, every member of Parliament runs the risk of being prosecuted by the Police or a well-motivated member of the public, sometime in the future. In other words, this was a “wake up call” to every elected representative, whether in a local body or Parliament. It will be a very, very foolish politician – whether from the Left or Right – who takes a punt at fudging their Electoral Return from now on. Because, in the final analysis, no Right or Left wing party activist, supporter, voter, or blogger, wants one of their own to be dragged through the Courts, embarrassing themselves and their Party. Whether Left or Right, we want our own people to be ‘squeaky clean’. The wake-up call has been sounded for both sides of the political spectrum. Let’s hope it was heard.. This blogpost was first published on The Daily Blog on 14 June 2014. I can understand the situation you find yourself in having been in the same situation myself. From this personal experience I can tell you that you are at serious risk of receiving a jail term of about 18-months. His Honour has given you the opportunity to qualify for Home Detention. The term is likely to be about six months. He is NOT going to consider a discharge without conviction. That is a delusional fantasy. If David Jones QC continues to suggest the possibility my advice is to sack him and file a complaint with the Law Society on the basis of gross incompetence. See my attached missive on the process. If you get home detention your overseas travel will suffer minimal disruption. Any jail term of one year or more and the Inter Islander Ferry may be about your limit. How then do you ensure you stay out of jail? Immediately as part of acceptance resign from Parliament. Do not dance on the head of a pin before the Probation Officer on the difference between “Found Guilty of an Indictable Criminal Offence” and “A Conviction being entered”. On Monday YOU contact the Probation Service. Do not let your clown of a lawyer do it or wait for a Probation Officer to phone you. Tell them you have royally screwed up and that you are unconditionally guilty. Do a press conference and make an unreserved apology to the People of New Zealand for your conduct. Back that up by a huge donation to low decile schools. Do not say which ones or how much. Tell them you will not be appealing the verdict. DO NOT ATTACK OTHER PERSONS INVOLVED IN THE CASE. Assure the Probation Officer that you will comply with all instructions and conditions of Home Detention no matter how tedious. And they will be tedious. Treat the Probation Officer with respect. Do not make racial or serious remarks. You may find your Probation Officer is a young female Criminology Grad less than half you age. The Probation Service will need to approve your apartment for Home Detention. From my experience it is probably not suitable. The reason is that a Probation Officer or Security Guard cannot walk up to the front door 24-hours a day because of the building security. Tomorrow rent a VERY MODEST house with walk up to the front door. Talk to the Probation Service about this. Finally welcome to the Human Race. We are not bad people who will become good, just human beings who do good and bad things at various times of our lives. Wishing you all the health, happiness and success I enjoy for myself one day at a time. Key has said he would not be bothered if his children were taught by unregistered teachers. Not bloody likely – Key’s offspring were taught in the most expensive private schools money could buy. No chance of Key’s offspring rubbing shoulders with middle class kids in State schools or working class kids in Charter Schools – the Key Clan could afford The Best. 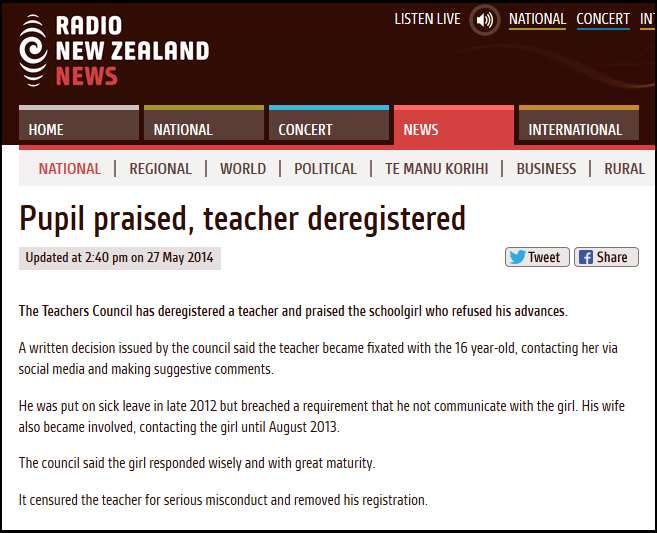 Coming soon to a Charter School near you: a teacher who has been sacked from his job and de-registered. But there is nothing to stop this man from being -re-hired by a Charter School. He has not been charged or found guilty of any offence, according to the story above – so any Charter School conducting a police background check will come up with nothing. The man’s identity has not been released, so even a simple Google search will come up with nothing. All he needs to do is remove the last school he worked at (from which he was sacked), and he effectively has a “clean” C.V. The policy of allowing unregistered teachers is a ticking time-bomb, and this blogger can already see tomorrow’s headlines; “Unregistered teacher at XYZ Charter School molests pupils“. There will be the usual ‘noises’ of “improving procedures and protocols” being made. But without registration, the pupils of Charter Schools will be vulnerable to predator-“teachers” who fancy a 12 year old boy or girlfriend. In effect, Parata and Banks – with the blessing of Dear Leader – have handed paedophiles their next victims on a tax-payer funded plate. As usual, it is the most vulnerable in our society who will be paying for National/ACT’s shonkey, ideologically-half-baked policies. allthingslearning: Can a teacher “create” LEARNing THAT LASTS? The Daily Blog: Does it get any more rich than this? 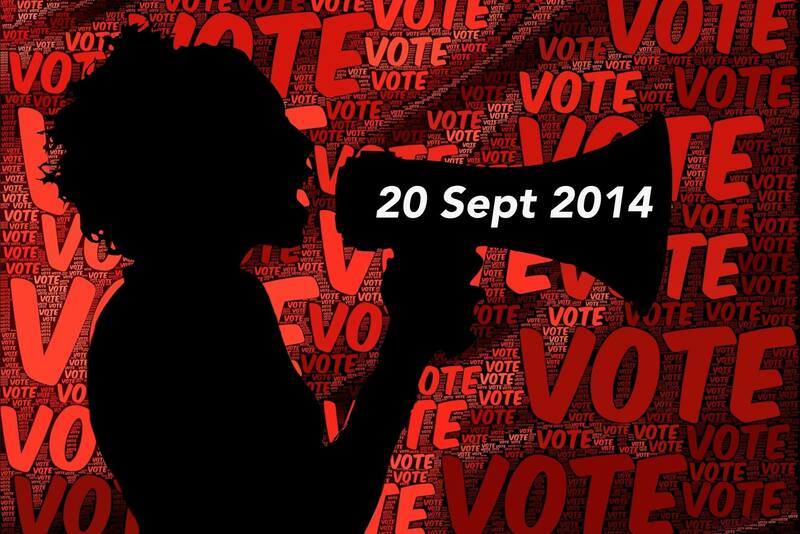 This blogpost was first published on The Daily Blog on 29 May 2014.